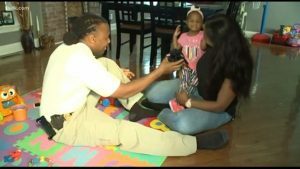 Leann Mosby, a St. Louis Fire Captain’s wife performed CPR on her 23-month-old toddler. Blaire is 23-months-old. She was sitting in this high chair snacking on a chip, when she started to choke. Leann’s used the CPR techniques that her fire captain husband, Garon Mosby, taught her. She had also called 911 and went to a neighbors house. Leann is encouraging everyone to learn CPR.